Soar your way to success as you now create clean and professional looking medical websites using the Prestashop medical Themes. Choose from hundreds of background themes and color settings to create a unique theme for your shop. Include a number of useful functionalities such as medicine dosage drop down modules, prescription organizers, and patient history inquiry modules to optimize your shop for a better shopping experience. 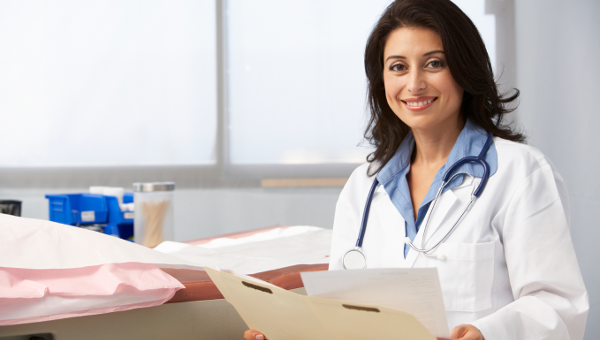 You can also see Medical Website Themes. 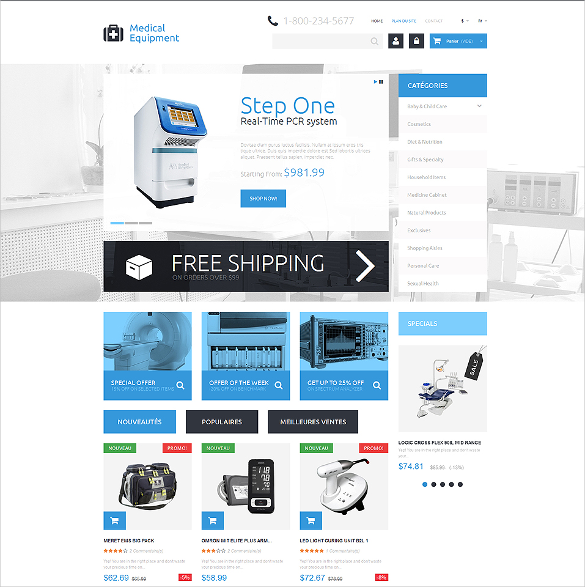 This Prestashop theme has a niche interface and delivers amazing performance for medical equipment portals. This theme is easy on installation and comes with detailed set of instruction to make it easier for users. 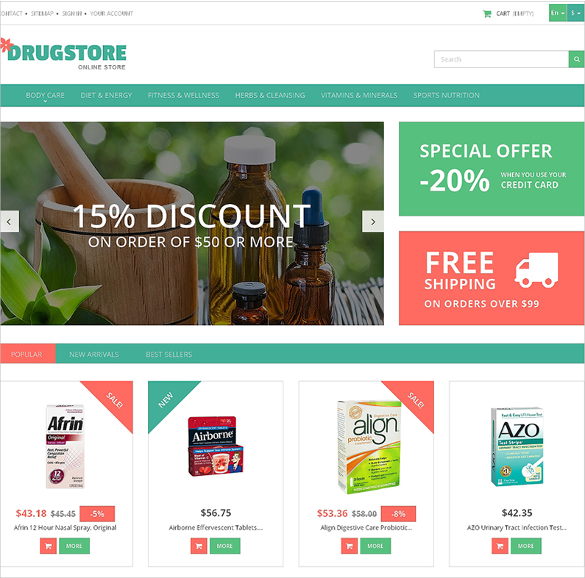 This theme creates a subtle greenish tone to any website and matches perfectly with portals selling medicinal drugs and tools. It is compatible with Prestashop version 1.6.0.x and above. This responsive theme supports multiple languages. 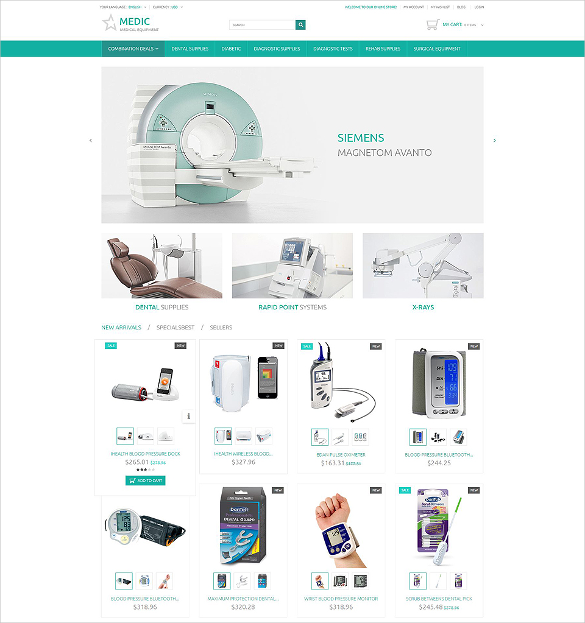 This is the perfect theme for creating niche effects to medical appliances e-stores. It is fully responsive and comes loaded with features like Drop Down Cart, Favicon, Quick Start Package, and Categories Accordion. 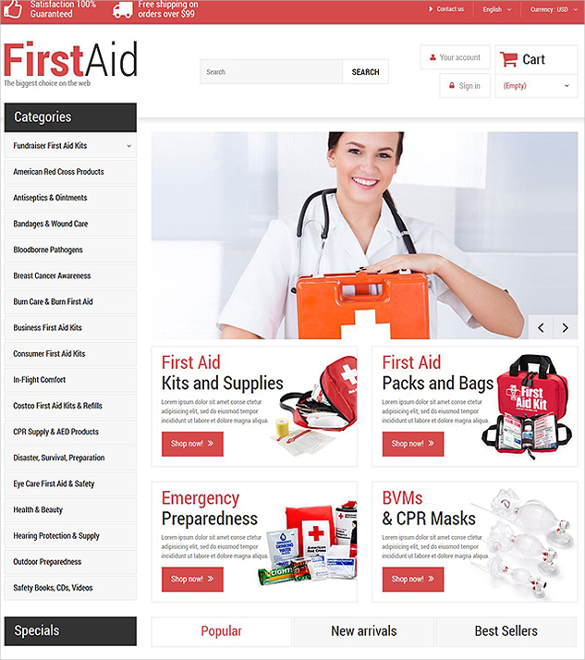 The white layout of this PrestaShop theme creates a clean outlook to medical equipment based e-portals. Totally cross-browser compatible, this theme provides four neat banner layouts that separate the header from the content area. 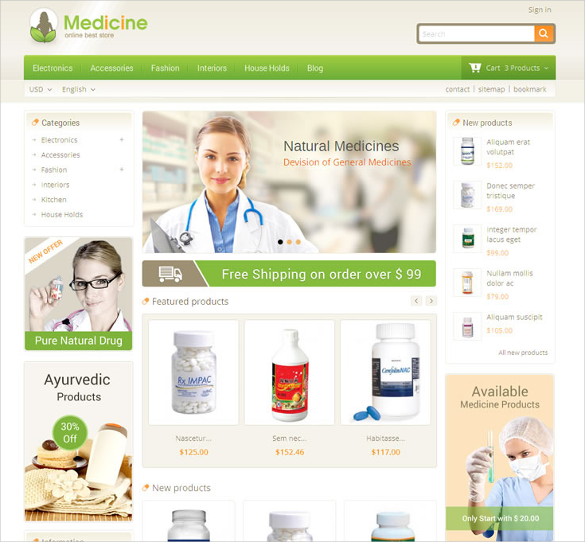 Want to launch your medical store online? Try this Prestashop theme that creates a subtle outlook to the store while introducing enriched features like Customized Widgets, Floating Sidebars, and Animated Footers. 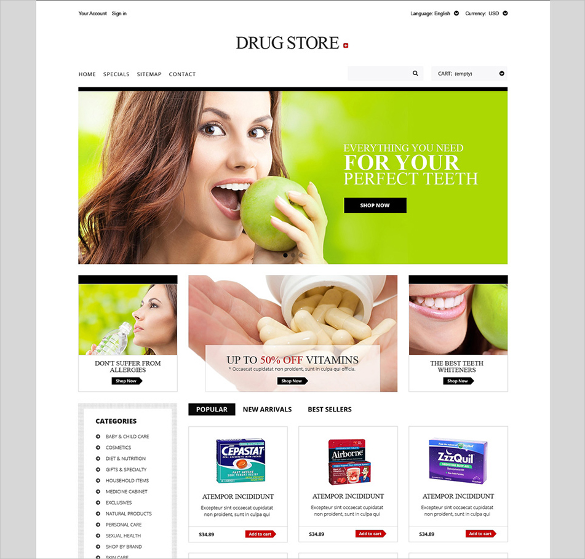 Drug Store is a 100% responsive PrestaShop Theme that can be used for designing healthcare stores. It creates a bluish appearance to the portal. With unlimited banner options and support for every PSD file, this theme can well be quite handy. The templates have complete compatibility with Prestashop Themes and have preloaded shopping cart elements, payment gateway pages and even instant checkout portals. The templates includes numerous customizable icons that can be utilized to remind customers whether they are purchasing tablet, capsules, or bottles and even inform them on the cards and payment methods accepted by your site. Look Out Medical HTML5 Themes. The powerful content management system provided with the templates allow content and media to be added instantly and keep you updated on the stocks left in the inventory. 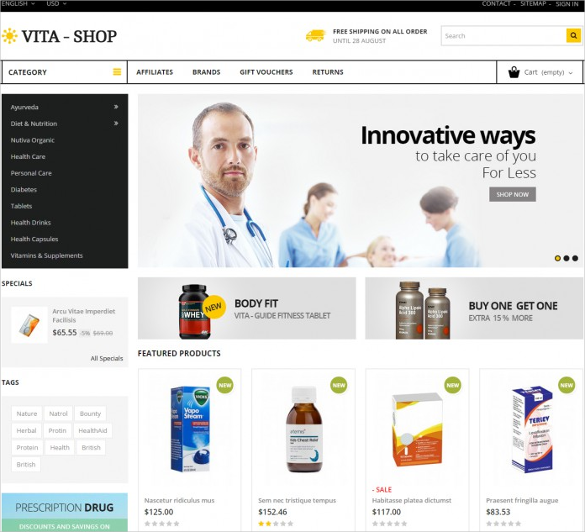 Also the Prestashop templates include product pre-order modules and out of stock reminders that keep both you and your customer on when you will be able to deliver the required medicines. The intuitive PHP powered auto fill modules save prescription forms from users and hint them when they visit the store again. The templates are mobile responsive and retina ready making them ideal for use in mobile platforms. Also the cross browser compatibility and HTML5 and CSS3 coding ensure that the site performs well even under peak traffic. The Best Prestashop templates also include inbuilt SEO tools and social integration plugins that allows for easy advertising of your online medical shop.